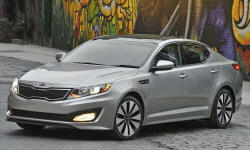 2013 Kia Optima Pros and Cons: Why (Not) This Car? The middle of just about anything is inherently boring. With cars, small and large, low and tall--all have their visceral attractions. In comparison, midsize sedans just take up space, with nothing notable about them in any particular direction. But many people's needs are best met by a midsize sedan. And not all of these people want an appliance. Car companies (or at least their ad agencies) realize this. Kia pitches the Optima as "not your average midsize sedan." How well does the car actually deliver on this pitch? Bold, driver-oriented styling. A lot going on. Why the 2013 Kia Optima? To my eye, the Kia Optima, Ford Fusion, and Mazda6 are the most attractive midsize sedans. None looks like the others--or like anything else in the segment. Which is the fairest of them all comes down to personal tastes. The Optima has the most conventional shape of the three, with edges and angles you won't find on the others' curvier bodies. Its proportions aren't the best. Front overhang appears excessive on lesser trims that lack the SXL's shiny five-spoke 18-inch wheels. Yet the Optima is also the most aggressively eye-catching midsize sedan. Dramatic shapes abound in the "tiger nose" grille, LED-filled lamp assemblies, and kinked side window outline. In case this isn't sufficient to stick out in a crowd, chrome trim has been liberally applied. The chrome ribbon that arches over the tops of the side windows to slice through the C-pillar then flow down the side of the rear window remains bold and fresh in the design's third year. Not all of these elements are integrated well. The strip of LEDs immediately above each triangular fog light appears tacked on and redundant. For some people, far too much is going on. For others, the exterior design will be the reason they buy an Optima. Unless you've been living under a rock, you're aware of Kia's 10-year, 100,000-mile warranty. The 10/100 warranty applies only to the powertrain, and only for the first owner, but it has sold quite a few Kias. The warranty on most of the rest of the car (including the powertrain for the second owner) is 5/60. Not 10/100, but still much better than the industry standard 3/36. Some things are covered for only 3/36 or even 1/12. Be sure to read the fine print--Kia dealers definitely do. We receive more complaints about warranty coverage denials by Kia and Hyundai dealers than all others combined because people assume that the 5/60 warranty covers everything. Reliability for the current generation Kia Optima has been running average or better--check the latest stats. Equally bold from this angle. Chrome trim and cut lines propel eye rearward. Strongly driver-oriented. White trim on black instrument panel for strong contrast. Not symmetrical. The Kia Optima SXL's 274-horsepower 2.0-liter turbocharged four-cylinder engine is among the strongest in the segment. Despite the use of boost, the power flows smoothly and linearly, without the surges and lags that often plague turbocharged engines at part throttle. Go full throttle to the redline, and the engine also sounds about as refined as fours get. This engine is paired with a six-speed automatic transmission that shifts smoothly and (unlike that in the Ford) usually finds the gear you want when you want it. If you want to call the shifts yourself, paddles are provided next to the steering wheel, but they feel cheap. With so much power on hand, front-wheel-drive is the limiting factor. When acceleration, a car's weight transfers rearward, limiting the traction of the front tires. Switch the Optima's traction control system off, and wheelspin happens all too easily. Even with traction control on, you've got to be careful with the pedal while exiting corners. All-wheel-drive, optional in the Ford Fusion, would help. Even without all-wheel-drive, and so without the ability to exploit the full potential of the engine at low speeds, the Optima SXL is very quick. You might miss the lustier sound of a V6, but you won't miss the performance. The Ford Fusion's engine is as strong through the midrange, but peaks at 240 horsepower, and must motivate a heavier car. It's probably just a few tenths slower to 60 mph, but because the Fusion is smoother and quieter the difference feels larger. Many auto makers are substituting turbocharged fours for V6s because of their theoretically superior fuel economy. The Kia Optima SXL earns EPA ratings of 22 mpg city, 34 highway. The similarly turbo-foured Ford Fusion comes close, 22/33. The most fuel efficient V6, in the new Honda Accord, manages 21/34 without paddle shifters, but 21/32 with them. Trip computer numbers suggest a one-to-two mpg advantage for the Kia in real-world suburban driving--perhaps too close to call since these devices aren't terribly precise. Figure just under 20 with a heavy foot, mid-20s if you resist the temptation, and just over 30 with a very light foot and luck with the lights. All of these figures are with the engine warmed up. In cold weather, fuel economy is in the mid-teens for the first mile or two. An eco mode makes little noticeable difference in either how the car drives or its fuel economy. These numbers don't seem particularly good? Recall that the Kia Optima SXL is a very quick car. You won't find a 274-horsepower sedan that does better without the aid of a battery pack. The Optima's interior is as highly styled as its exterior. No one else has the guts (or reckless disregard for consumer tastes?) to aesthetically and functionally orient the instrument panel and center console strongly around the driver. The SXL with white leather takes this look up another notch by upholstering the edge of the black instrument panel in this contrasting color. If this level of interior drama and driver orientation appeals to you, the Optima is the clear choice. As with the exterior, the interior styling could be a "why not to buy" for those with more restrained tastes, or who like every detail to be expertly integrated into a coherent whole. To take the drama down a notch in the Kia, opt for the all-black interior. The Fusion's interior design is much more balanced and subtle. Even the top-of-the-line Titanium lacks the Optima SXL's nappa leather and real wood trim, but otherwise the Ford's interior seems more solidly constructed and of higher quality. You'll find nothing like the Kia's white/black interior in the Fusion. All-black is the only interior color offered in the Titanium. Why Not the 2013 Kia Optima? When most people hear "Kia," they still think cheap. Well, with a list price of $35,275, the Optima SXL is far from cheap. In the SXL's defense, it includes materials rarely if ever offered in this segment, such as luxury-class "nappa" leather on the doors as well as the seats, real wood trim, and black cloth on the headliner and pillars that wouldn't be out of place in a Lexus. To the regular fully-loaded SX, the SXL also adds chrome wheels, painted brake calipers, and an electronic parking brake with auto-hold (you don't have to keep your foot on the brake while waiting for a traffic light). TrueDelta's price comparison tool doesn't adjust for the quality of the leather, as there's no clear way to grade leather. Credit is given for most of the other SXL-specific features. Even so, the Optima SXL lists for $2,590 more than a similarly-equipped Ford Fusion Titanium before adjusting for feature differences, and a still significant $2,145 more afterwards. If the premium materials truly elevated the Optima SXL into a higher class, then the $3,350 they add to the price would seem quite reasonable. But the real wood doesn't look real, and enough bits designed for a $25,000 price point remain that the price seems a little steep. To provide overtly sporty handling, the Optima relies on firm suspension tuning. Though rarely downright harsh, the Kia's ride can feel abrupt, choppy, and generally much less refined than the Fusion's. Wind and road noise levels are about average for the segment, and not those of a premium car. Buyers seeking a smooth, quiet ride will prefer just about any other midsize car. Perhaps because styling was the higher priority, the Kia Optima's controls aren't the easiest to use. The buttons for the audio and climate control systems form a couple of large arrays. Even after a week in the car I often had to look away from the road for a few seconds to find the sought button. The buttons for the seat heating and cooling controls aren't even visible--the shifter blocks them from the driver's view. The Optima's rear seat is comfortably shaped, and includes plenty of room for passengers to stretch out their legs. Heads are a different matter. Though I'm only 5-9, if I still had much hair it would have been brushing the headliner. The Fusion provides a little more rear headroom, but less knee room. Buyers seeking a rear seat suitable for large adults won't be happy with this aspect of either car. The Kia Optima SXL's stiff suspension and quick steering do make it much more fun to toss through curves than the average midsize sedan. Though dimensionally within an inch of the Ford Fusion and only about 140 pounds lighter, the Optima feels significantly smaller and lighter. Credit a more open view forward, higher noise levels, and friskier tuning. So why is handling in this section? The Optima SXL might be more enthusiastic, but it's also much less polished. Driven at speed over bumps and dips the car struggles to maintain its composure. A Ford Fusion feels more precise, planted, and controlled. Also, the level of assist provided by the Kia's electric power steering varies in an inconsistent, unnatural way. Perhaps to counteract torque steer, the steering often (but not always) feels oddly stiff just off center. For the lighter feel of the Kia with the precision of the Ford, check out the Mazda6. But not if you also need the Optima SXL's powerful acceleration: the Mazda isn't available with a 200-plus-horsepower engine. Consider the Kia's tagline earned. With its bold styling and aggressive suspension tuning, the Optima SXL isn't the average family sedan. Of course, the average family sedan looks and drives like it does because many people want a car that's smooth, quiet, and easy to operate. The Optima wasn't designed with these people in mind. It doesn't ride smoothly or especially quietly, and its interior design puts form ahead of function. The average buyer might also find the Kia's styling too busy or too bold. rnBut is the Optima SXL nevertheless a good car for driving enthusiasts? Perhaps if they value enthusiasm over finesse. But the best chassis in the segment can be found under the Ford and Mazda. Ultimately, the Optima's largest strength is how it looks. Love the styling? Then the car's shortcomings are probably small enough to be forgiven (with the possible exception of ride quality). Don't care for the styling? Then you'll be happier elsewhere. 274 horsepower, smooth and nearly lag-free. EPA ratings (22/34) good for such a powerful engine. About average trunk volume, 15.4 cubic feet. Kia provided an insured car for a week with a tank of gas. 2013 Kia Optima pros and cons, according to Michael Karesh: the best reasons for buying (or not buying) the 2013 Kia Optima. Join TrueDelta to post your own impressions. No pros or cons, per se, but I'd like to know whether you have any plans to review any of the 2016 Optima models? Based on the few reviews I've seen recently of the SXL and SX, it sounds like Kia has made some improvements that have resulted in a much more satisfying car to drive. While, it looks like the fuel economy is still fairly midling, the handling, performance and overall comfort appear to have been much improved. Question is, is the SXL for real and is it worth a price in the mid $30's? I've asked for a 2016 Optima to review. Unclear when I'll get one. The review above is of the previous SXL. If the rest of the car is now as good as the leather, very well could be worth it--especially the actual transaction price (midsize sedans tend to be discounted while gas prices are low).